Previewed at: Palace Central, Sydney, NSW, on 15 December 2017. Steven Spielberg gets his teeth into the origins of the scandal that became known as the ‘Pentagon Papers’ in his latest film, The Post. The ‘Pentagon Papers’ was the name given to an exhaustive study of the Vietnam War covering US involvement in Vietnam between 1945 and 1967. Commissioned by then Secretary of Defense Robert McNamara (Bruce Greenwood), it was written in-house at the Pentagon but subsequently leaked by one of it's authors, Daniel Ellsberg (Matthew Rhys). The movie's title refers to The Washington Post newspaper which, in 1971, picked up this politically sensitive hot potato when it published excerpts from the ‘Papers’ after The New York Times had been forced to stop covering the issues they raised because of a President Richard Nixon-sought court injunction. It was a bold and risky move which could have led to the gaoling of the publisher, editor and writers involved, set a precedent for the muzzling of the press and the suppression of free speech thereafter. Katherine ‘Kay’ Graham (Meryl Streep) was the publisher of The Washington Post; the paper had been in her family for many years, having been acquired by her father in 1933. She became de facto publisher in 1963 after the death of her husband, Philip Graham, who her father had appointed publisher, and officially took on the title in 1969. A long-term friend of McNamara and a bastion of conservative Washington society, she was highly conflicted when the ‘Pentagon Papers’ came into The Post's hands and had to be prompted by her editor Ben Bradlee (Tom Hanks) to keep the values of press freedom firmly in mind when making her decision to publish or not. Naturally, the powers-that-be at the paper were urging restraint, not wanting to get on the wrong side of the Nixon White House. The great bulk of Hannah and Singer's thrilling screenplay covers this tense period as these two opposing forces jostled for supremacy in Kay's mind. 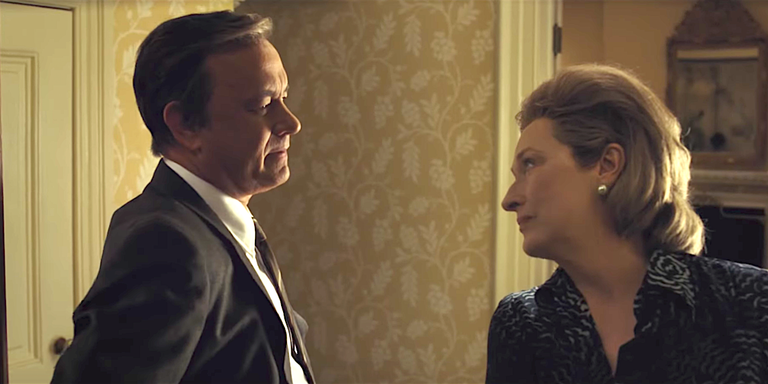 It's strange to think that two of the best actors of the baby boomer generation, Streep and Hanks, have never appeared together in a movie before The Post and it's fitting that one of the best directors of that same generation, Spielberg, has finally brought them together. They inhabit their roles, Streep especially, and Hanks, who can be quite ‘Hanks-ian' at times, completely becomes the younger Bradlee (who was 50 in 1971) through his bravura performance - and with the help of a well-chosen wig. The supporting cast are excellent too, in particular Bob Odenkirk of Better Call Saul fame as a gung-ho reporter, Bradley Whitford as Arthur Parsons, a board member of The Washington Post and Bruce Greenwood as McNamara. Spielberg's go-to composer, the great John Williams, contributes a fitting score, referencing the newsroom atmosphere of the film's setting. To his credit, the director recognised the screenplay as being highly relevant to today, when the press is once again under attack from the White House, and rushed his film into production - but you wouldn't know it: all technical credits are top-notch. The Post was nominated for six Golden Globes, including Best Motion Picture (Drama), but missed out to Three Billboards Outside Ebbing, Missouri. The Hollywood Foreign Press had a tough call on its hands; it's been a good year for films and this one is up there with the best.